The purpose of the tour and event is to highlight the value of township tourism value chain. 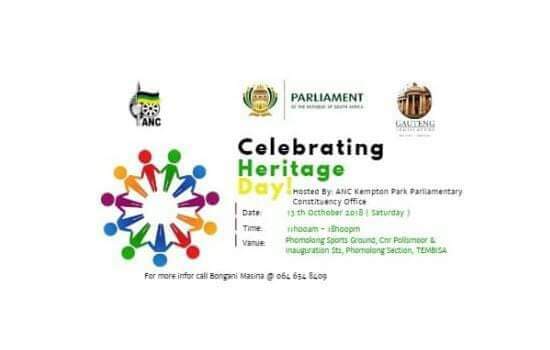 The programme will start with a Tour on Heritage Sites within different locations or sections in Tembisa and we then host a Social Dialogue and conclude by supporting our fellow Exhibitors and Food Vendors, thus concluding by Entertainment from various groups. i.e. 08h00-10h30 Briefing and Tour by Political Leadership, Leadership of Organs of Civil Society, Organs of People’s Power, Speakers of the day, Officials from the PCOs and Government departments and its Agencies; 11h00-14h00 Social Dialogue to be attended by all Stakeholders, including Vendors and Exhibitors; 14h00-18h00 Entertainment, Poetry, Arts, Exhibitions, Networking Sessions etc. We have invited about 300 people on the day. We have invited the MEC for Sports, Arts, Culture and Recreation, MMC deployed , Gauteng Tourism Authority, National Heritage Council and other key relevant stakeholders such as Experts, Community Leaders, Artists, Poets, Story Tellers, youth, women, people with disabilities’ organisations and formations to this august event. We hope this will reach your favorable consideration as we aspire to promote our cultures through music, food and engender the spirit of Ubuntu among ourselves as Africans.